I was born and raised in this area. I’m a local whichever way you look at it and after travelling and living in different countries and places, I cannot imagine living anywhere else. You couldn’t find anyone who would endorse buying property in this area more than I. 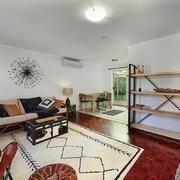 This 1-bedroom apartment is on the ground floor of the iconic art deco "Broadview" building opposite the Brunswick River. It's a great investment/holiday unit with very solid rental returns and positioned extremely well for capital growth in a sought after and consistently undersupplied market. The property is currently holiday let with existing bookings. 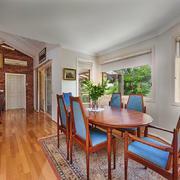 Within walking distance to everything Brunswick village has to offer, this apartment has authentic 1930's appeal. Timber floorboards and high ceilings, timber windows overlooking parkland and the river. The full-size kitchen has plenty of storage with all the facilities for cooking and a dishwasher. In the queen size bedroom, you will find a built-in wardrobe and access to the bathroom, which is fresh white and houses the internal laundry. Reverse cycle air-conditioning and ceiling fans throughout are cooling for Summer evenings if you need more that the sea breezes. These apartments are very hard to get and often sold before they go to market. Call immediately to make an appointment. 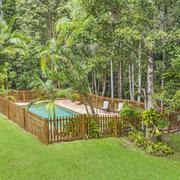 This is a rare chance to grab a beautiful creek side acre in Mullumbimby. It is with a heavy heart that the owners have decided to downsize from what has been the perfect place to bring up their children. The home is family sized and suited with privacy from the street and recent renovations have updated the kitchen and bathrooms so there is nothing to do. Even the western windows have had specialist tinting to keep the house cooler in Summer months. Fully landscaped grounds are adorned with mature plantings including an abundance of healthy fruit trees. 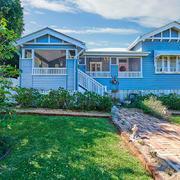 Established garden beds and paths wind through the property down to a shaded frontage to the pretty permanent creek. 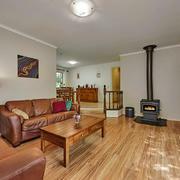 The town centre, schools and sporting fields are all a short walk away. A fully serviced 40 square metre steel framed shed at the back of the house is perfect for storing and tinkering and 3.7kw of solar power will help keep the bills down. A great property that gives you both convenience and space. 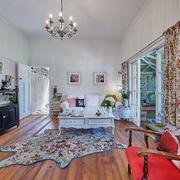 Set on a rolling green acre with 90m of permanent creek reserve frontage, this property has a wealth of features to offer. 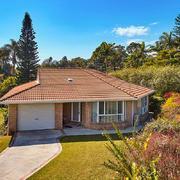 Established gardens and fruit trees, four car garage, and a big family home. Extremely well built double brick and suspended slab construction with terracotta tile roof, the solid 2 storey house will accommodate a growing family or multi generational living. 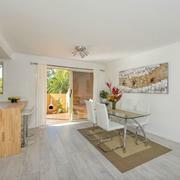 Open plan kitchen and dining areas have views over the property and allow the cooling breezes right through the home. 4 good sized bedrooms all with built in wardrobes are part of a floor plan which lends itself to easy living. Downstairs has a large rumpus room with high ceilings and bathroom, which could easily be used for guest accommodation or shared living. There is also a 2-bay car port, perfect for storing vehicles and or machinery. You can walk to town, the Bowling Club, Golf Club and Olympic sized swimming pool. Community convenience with room to move and grow. Tonnes of space for chooks, gardens and pets. This property has fantastic bones and oodles of potential. This property is waiting for the magic touch. 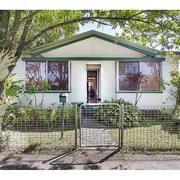 Well positioned on a corner block with two street access, there is plenty of space for boat or caravan storage. A beautiful old poinciana tree spreads out over the front corner of the block providing shade and privacy. Inside the home you will find a large, bright family living area, leading on to the dining room and retro kitchen. A new induction cooktop and oven have made meal preparation easier. The master bedroom has built in wardrobes and an ensuite, and the two other bedrooms with built in robes. No excuses for clutter with two large linen press or storage cupboards. Internal entry to the oversized double garage is useful in inclement weather to unload the shopping or kids from the car and two concrete driveways with street parking for four cars. Within a 12-minute stroll to the waters edge at South Golden Beach, this little gem sits near the creek and reserve in a peaceful cul de sac. Public access to the canal is just steps away for those with kayaks or SUPs. The kitchen is light and bright with warm terracotta toned tiles flowing through the home. Open plan living and dining areas are ideal for family life. The yard is flat, and the back yard is fenced, safe and secure for children or pets to play. All three bedrooms have built in wardrobes and are positioned close to the bathroom. 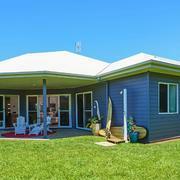 The potential to split the home makes it very suitable for shared living with extended family. 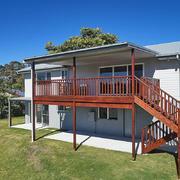 The property also lends itself to adding a separate fully serviced granny flat. (STCA) The outdoor covered entertainment area runs the whole width of the rear of the home, where family and friends can gather to enjoy each other's company. Here's a low maintenance home with nothing to do but move in and unpack. Direct golf course access and views of the lake, fairway and green make this property special. Sit on the veranda and enjoy the manicured outlook of the 4th hole, including the waterways surrounding the green. 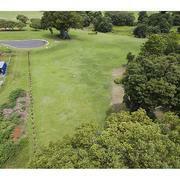 The 923m² lot has dual occupancy development potential, a rare thing on the golf course. Inside you'll find a family home with recent upgrades to the kitchen, main bathroom and also new bedroom carpets and heathered vinyl planks throughout the rest of the house. Your bills will be much cheaper with solar power and your hot showers can be longer with the solar hot water system. 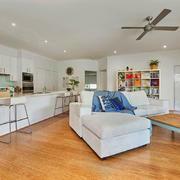 Open plan living, dining and kitchen merge together and flow out on to the back veranda. 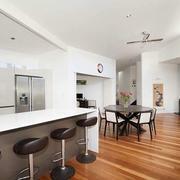 In the kitchen there are stone benchtops, induction cooktop and an internal laundry. Louvred windows bring in the breezes from the rear of the property. The large family bathroom is stylish with separate bath and shower. The master bedroom has a built-in wardrobe and an ensuite. Two further bedrooms are well sized, one with a build in robe, the other with expansive golf course views. 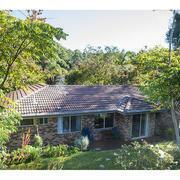 Well established trees and plants in the grounds make the property private from neighbours. A double garage and off-street parking for another two cars makes this home perfect for the modern family or a golf enthusiast! 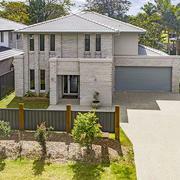 Right on the edge of Water Lily Park, this fabulous modern home is waiting for its new family. Light fills the living areas, coming in from the double height gallery windows. The kitchen is great, there is plenty of drawer storage and a big bench for pulling up a stool. 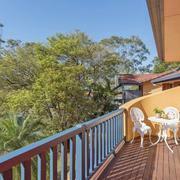 Open plan living and dining areas flow out on to the back deck with views over the adjoining park and lake. The rest of the downstairs accommodation comprises of a luxurious master suite, enjoying the same outlook and a walk-through robe leading in to a spacious bathroom. The second level has a wide gallery style landing area overlooking the void and living space. The two large upstairs bedrooms and family bathroom are all bright and have heaps of storage. Expressions Of Interest - closing date 22/11/18. All best and final offers being submitted 23/11/18. This is a great unit in a convenient location just a 2 minute walk to the shops. Ideal for the first home buyer or investor, this 2 level apartment has an attached garage and a private outdoor entertaining area with rear access. The family friendly layout provides perfectly for a family with all the bedrooms upstairs and all the living downstairs. All bedrooms have built-in wardrobes and ceiling fans. The complex is in very good order with recent refurbishments and enhancements further improving the building. Do not miss this one. 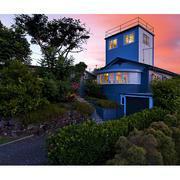 A rare elevated vacant parcel with panoramic views of the ocean, valley and hills. Architect designed plans have already been approved by council which take full advantage of the outlook and north aspect. The roundhouse lots were snapped up in a flash when first released. 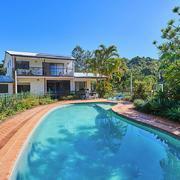 This could be the last chance ever to grab a vacant lot on this iconic Byron Shire hilltop. Call us and make an appointment to meet us onsite. 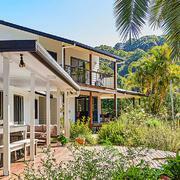 Commercial opportunities in Mullumbimby are few and far between. This one is a beauty, solid old single level brick building with great tenants. Out the back there is plenty of room to move, with ample parking. Good frontage onto Dalley Street for exposure and presence. The rear lane access is vital for operating a business, it also provides potential for further development of the property. A preliminary town planning report is available for prospective investors. 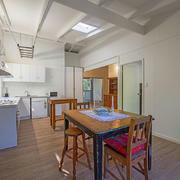 It’s a great location in the centre of town, close to the post office and other key service providers. Call Todd now. Within a two-minute walk to the sands of South Golden Beach, this property sits amongst other quality contemporary homes. Vaulted ceilings, big windows and a light colour palette bring the sunshine inside. 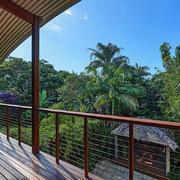 Open plan living, dining and kitchen areas are central to the design of the home and the wrap around corner deck is a great place to enjoy the tropical mature gardens while swinging in a hammock. The kitchen is well placed with plenty of storage with an electric oven and gas cooktop. The generous wide bench is a good spot for keeping the cook company or sharing breakfast with the kids. The master bedroom is complete with walk in robe and en suite bathroom. Two further bedrooms are all well sized and have built in wardrobes, perfect for a growing family. There is also a fourth bedroom/study. 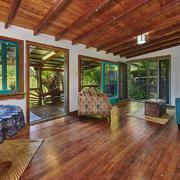 Freshly polished timber floors throughout the property are the finishing touch to a beautiful place to call home. The farmer's markets at nearby New Brighton on Tuesdays are the easy way to join in community events and enjoying a coffee at one of the local cafes is a sure-fire way to do the same. Ocean Shores primary school is less than a kilometre away, so is the community preschool, skate park and play ground. This gorgeous contemporary home is an elegant option for downsizers not willing to downgrade, and for young families wanting space without the big price tag. A sun-filled home which immediately impresses with a large living room, extra-large kitchen with brand new oven, extensive storage, high ceilings and an intelligent floor plan for easy living all year round. 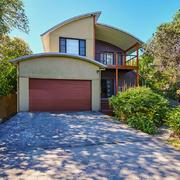 Located in one of the only cul de sacs in Ocean Shores which offers the convenience of a 2-minute flat stroll to the shopping centre and the benefits provided by the surrounding national park. The centre has a Coles, tavern, medical centre, bakery and many other specialty stores. 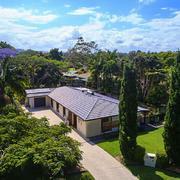 It is only a 2-minute drive to Brunswick Heads and 30 minutes to Coolangatta Airport. The large master suite has a walk-in robe and ensuite and is well separated from other bedrooms with its' own private balcony. The property is fully fenced and landscaped for privacy which also keeps the children or pets safely inside the yard. 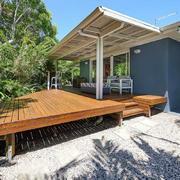 It also features reverse cycle aircon and indoor-outdoor living on the timber deck. Todd and his team were professional, friendly and a pleasure to deal with. Going the extra mile is not an exception but the norm for these guys. They made a stressful process easy and streamlined while keeping the end goal in sight. 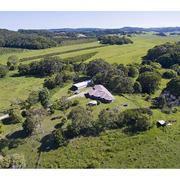 I cannot recommend Byron Shire Real Estate highly enough, thanks Todd, Sarah and Natalie. Thanks Todd, you were friendly, informative, flexible and made my house purchase stress free. I would highly recommend your services to anyone buying in the area. (And the champagne was lovely thanks!) Cheers! 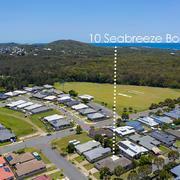 Thank you all so much for the hard work you did with the sale of our property at 10 Seabreeze Pottsville, we are very happy that it has all be finalised, certainly will use you again if we decide to sell another property in the future. 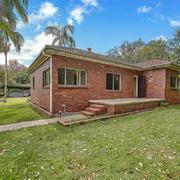 Todd and his team were fantastic in the dealings we had with the purchase of our new property. They were honest, prompt in answering all of our questions and imparted their knowledge of both the property but also the shire in which we bought. If we were to ever sell (no chance as we love our new home) we would definitely use them. From the first meeting to Settlement, Todd & the team, were nothing short of exceptional. As it was a particularly hard time for me, the skill, warmth & reliability made the entire process manageable & happily very successful. I have nothing but complete gratitude & admiration for Todd, Sarah & Natalie & wouldn’t hesitate to highly recommend Byron Shire Real Estate. I wish them great success & happiness. 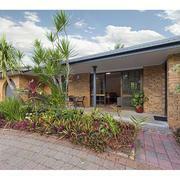 Many thanks to Todd Buckland and his amazing team at Byron Shire Real Estate (especially Sarah and Natalie) for selling our home. Todd knows the local market so well and works with integrity and honesty. He gave us a realistic estimate of the sale price we could expect, and helpful suggestions about what to do (and not do) to maximise our success. Together, we achieved a great result within a couple of months. Todd Buckland & Todd Martin achieved a great result for us. They conducted a first class selling campaign with a very good property appraisal reflecting a detailed knowledge of the market, followed up with an excellent web presentation. They conducted house inspections regularly and always followed up with feedback. Throughout the two Todd’s maintained a relaxed and friendly attitude which we found very reassuring. I have no hesitation in recommending them. Great guys. A big thank you for the Todd and the team at Byron Shire Real Estate Brunswick Heads for his/their excellent service and most importantly, the outstanding result achieved, i.e. the sale of our home and the purchase of a new home within a short and relatively stress-free period. Todd and the whole team have been at all times very dedicated, professional and relaxed in their approach. We enjoyed dealing with everyone at the agency. They were friendly, funny, efficient and easy to get on with. And they were always approachable and ready to help, ready to assist with anything we required, facilitating inspections, finding plans, arranging meetings, etc. And most importantly they made things happen. Both the sale and purchase happened in a very short time while achieving the result we were looking for. Selling, buying and moving house are stressful events. We managed to do all 3 within a couple of months, and Todd and the team more generally were an important factor in achieving this. I have got no hesitation in recommending these guys to whoever would like to make things happen real estate-wise in the Byron Shire.